WHICH PLANE(S) DO NOT BELONG HERE? 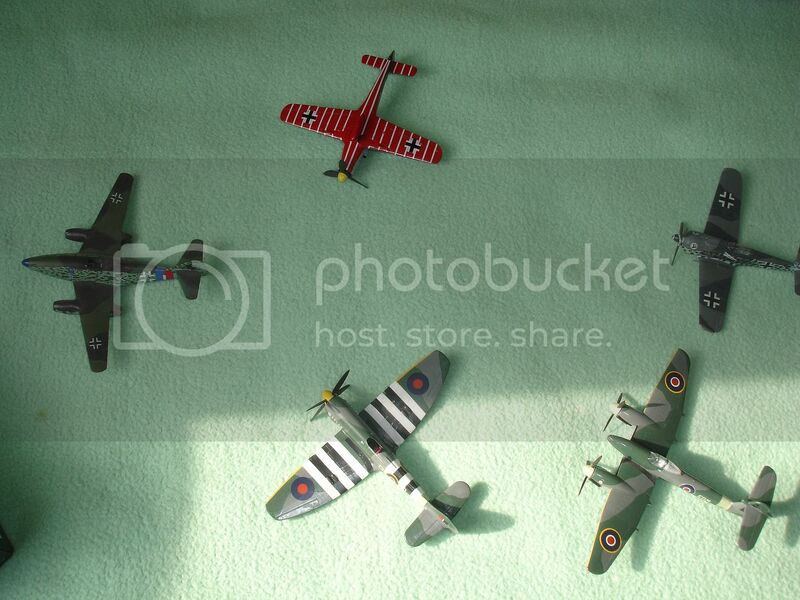 I found these planes on the spare bed. Some belong there but other(s) don't for a certain theme of late WW2? It is based on a real situation over German occupied land. That's true, they did get rid of it but that was a stupid choice because that plane was actually a very fast and formidably armed (4x20mm) fighter. RAF wanted something else. Yes, this is one of them but there is another one and why does the rest belong together? German stuff defense of Berlin 262 and 190D, Tempest for Rhubarb attacks over the german heartland. Rhubarb is a generic term for strafing ground targets with mg or cannons....but you get a cigar. The Germans used the Me262 which was too fast for allied fighter and a killer against bombers. The allies had a chance to get the Me262 during take off (and landing) during an ambush attack because the jetengines couldn't develop a lot of power during the take off....the Me was slow in acceleration and low altitude tuned planes were able to keep up with them (Tempest was one of the fastest, but also certain spits, mustang, thunderbolt). So during a bomb raid such allied fighters would scan ahead and attack the Me before they were too fast. The Germans noticed that lol......so they needed prop fighters to defend their Me. They used the Fockewulf Fw190-D9 a lot for that. The airfield's Flak also tried to hit the allied planes and in order to prevent confusion and kill friends they decided to paint the German's bottoms red-white striped....the German's called that squadron the parrot squad.